Connected Google Analytics but no conversions showing in dashboard? 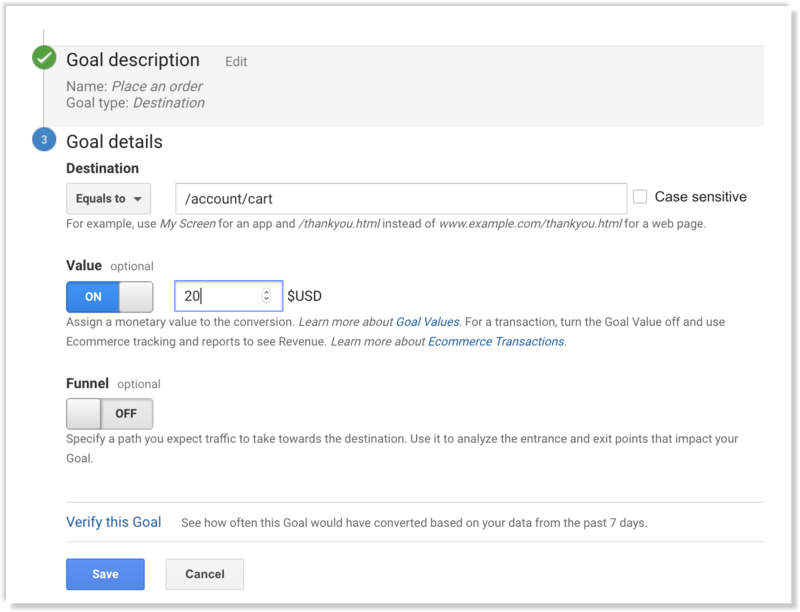 In-depth guide to making sure your Google Analytics goals are set up properly to track Fomo conversions. Your Fomo dashboard is a hybrid of statistics that we measure and aggregate with our internal technology, along with conversion data that we import from your Google Analytics account, if you choose to connect it. 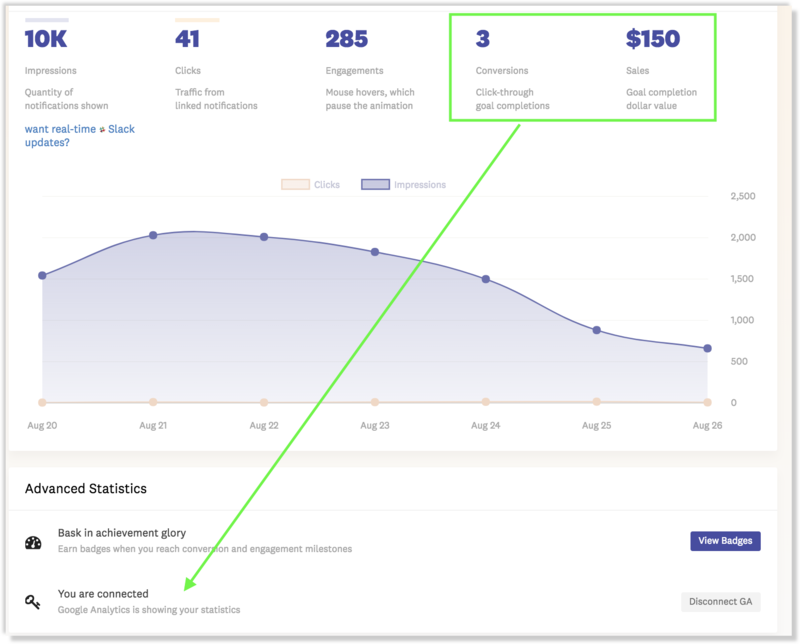 Impressions, clicks, and engagements will always aggregate in your dashboard and display updated values regardless of whether you connect GA, since these metrics are measured and updated through our own technology. 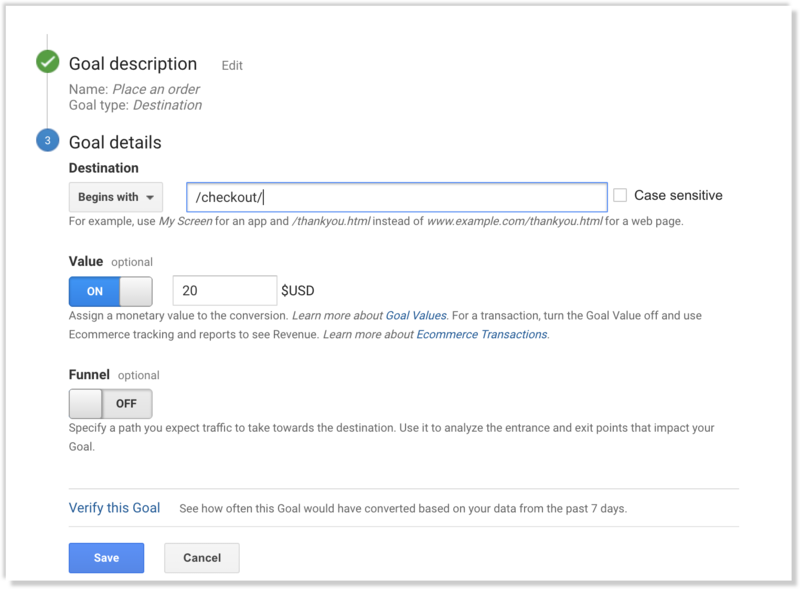 The last two values in your dashboard, 'Conversions' and 'Sales' come directly from Google Analytics. The 'Conversions' value will increase each time one of your associated GA goals is completed. Google has a great resource that goes over the steps to configuring goals. 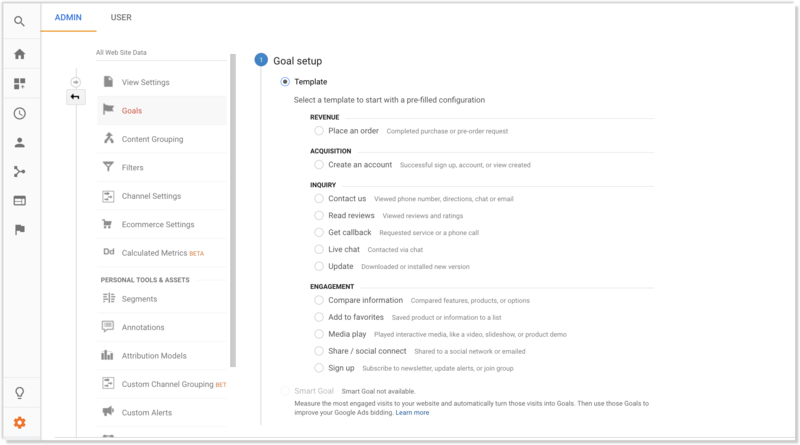 If you've had Fomo running on your site with GA connected and have 0s displaying for both 'Conversions' and 'Sales' it is worth checking out the configurations of your goals, as these values will not aggregate if your goals are configured incorrectly. 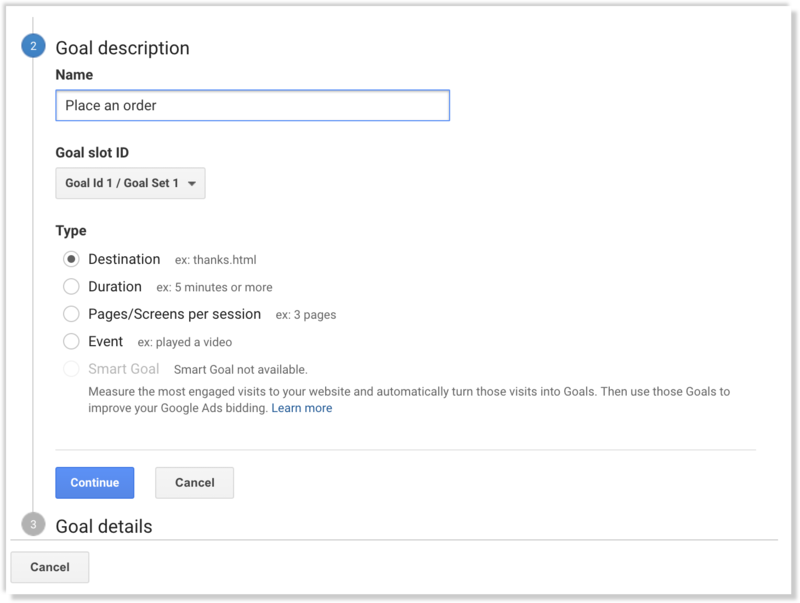 You can access Goals by clicking on 'Admin' from the left hand menu in Google Analytics. Make sure you're in the right app/website if you have multiple registered in GA, and then you can click on 'Goals' on the far-right menu. For most use cases, a template will work for you. For ecommerce stores, 'place an order' will handle purchase transactions, where for email signups and newsletters, you can use 'Contact Us'. We're going to use 'Destination' as the type of goal here- this will allow you to either set a specific URL in the next step, or use pattern matching to check if the Destination URL includes specified characters- ie 'checkout'. When a user reaches the Destination URL, this will count as a goal completion. If you're going to use multiple goals for ecommerce transactions or signups, make sure to name the goals something clear that distinguishes this for you. This step is important here as the specified URL is unique depending on your site's URL paths. if you use 'Event' for the type, this would require creating an existing event unique to your site/goals in GA beforehand. Make sure that the URL you set for the destination actually exists! For example, if you use 'Equals to ' instead of 'Begins With', the URL that you add needs to be 100% identical to the URL the user reaches when completing the goal- trailing slash included. For example, if we use 'Equals to' /thanks but the full URL in the browser is/thanks/ , the goal will never be triggered. In this case, you can use 'Begins with' /checkout/ instead of 'Equals to'. This way the rule will still be completed successfully even though the full URL path is different each time. 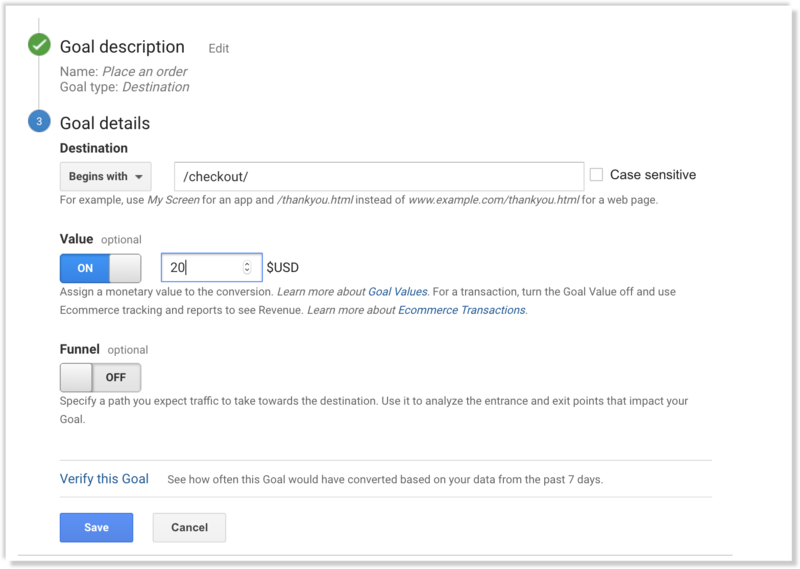 If you do not set a value for the goal here, 'Conversions' will still aggregate in your dashboard when the goal is completed successfully, but no values will aggregate in the 'Sales' area in your dashboard. You can see the sub-caption mentions 'Goal completion dollar value'. This refers to the value that is set above in 'Goal details'. So if you set the value to $20, each time the goal is completed, your 'Conversions' would increase by 1, and your 'Sales' would increase by $20 within your Fomo dashboard. After your goals are configured in Google Analytics and you've connected your GA account to your Fomo dashboard, we fetch recent goal conversions every 4 hours. If you've been using Fomo for a while and just finished configuring your GA goals, check back in your account tomorrow to see lifetime conversions.